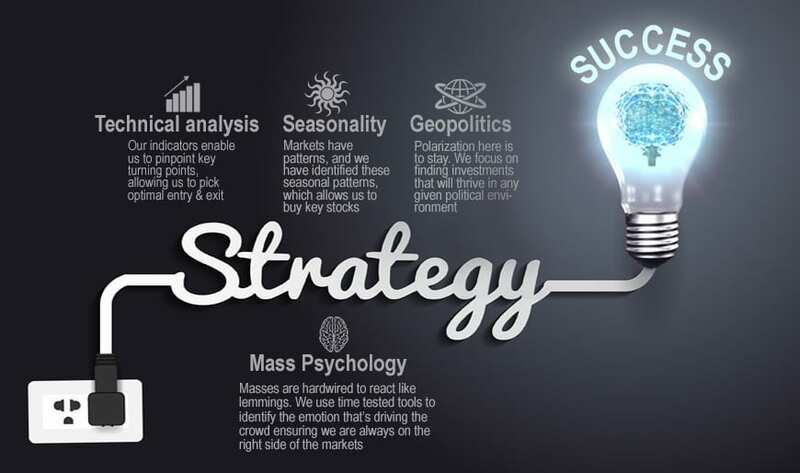 The Tactical investor is the place where Mass Psychology and Technical analysis converge seamlessly ensuring we are always on the right side of the markets. Emotions and not logic drive the markets. Emotion drives every investment decision. Mass psychology identifies the emotion that’s driving the crowd, and identifying the emotion, we can identify the trend, which allows us to get into investments just before they take off. Tactical Investing amounts to combining Technical analysis with Mass psychology creating a system that is second to none. The Trend Indicator is an example of such a system. It combines the most important aspects of Mass psychology with the best of Technical analysis to yield a system that identifies the trend in advance of the event. Our technical indicators also enable us to identify crucial turning points in the market accurately. Over 85% of the plays issued have trended higher. Tactical Investing amounts to being on the right side of the markets at the right time. To ensure we are always on the right side of the market, we incorporate the four elements (shown in the infographic) into our analysis. Employing this methodology gives us an advantage very few systems can boast; we can spot trend changes in advance of the event. Give the resiliency of this market; the Dow could very easily trade to 22K before it trades to 19K. Market Update July 6th, 2017. The odds of a crash are low. Markets never crash when the crowd is uncertain, and those in the neutral camp are usually the most confused players out there. We would gladly welcome a substantial pullback. Market Update July 2, 2016. If one combines the concepts of Mass psychology & Tactical investing the results are usually spectacular. It’s the best way to invest for the long term.